A Facebook business page is now an essential part of any business marketing strategy. Just having a page is not enough any-more though; business owners need to know what type of content to post and when to post it. If you have a Facebook page for your business or company, it MUST be a LIKE page, not a profile with friends page. Facebook have become very strict about this rule in the last year. I have seen many instances where people have been using a profile page for their business and one day without warning, they cannot log in. When they contact Facebook, they are told that they must switch the profile page to a LIKE page or they will lose their profile page, no debate or discussion. Please, if you have a profile friend’s page for your business, change it to a LIKE page ASAP. If you need help doing this, I have done this before so contact me. You have your Facebook Business Page, now what? 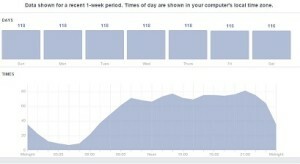 Part of having a LIKE page is the access to Facebook Insights. This is your analytic’s for your page. There are all sorts of interesting data, which I will explore in a future post. For now, let’s keep it simple and just check when the people who LIKE your page are active on Facebook. You will now see an interactive graph, with the days of the week at the top. By clicking through the different days of the week and moving along the graph, you can see when the people who like your page are on Facebook. Use this information to create a timetable of what time on each day is the best time to post on your page. Now you know when to post, you need to work out what to post. Facebook have changed the way people see your posts a lot over the last year. They don’t like promotional posts and will drastically reduce the organic reach. This is not good for a business page. Facebook Business Page Admins have to be clever and have a content posting plan which maximises their organic reach and at the same time promotes their business. One of the best ways to get great organic reach and still promote your business is to run a competition on your page. But wait, before you do, you need to check out Facebook Rules for running a competition. When business first started using Facebook a few years ago, a popular way to get completion entries was LIKE & SHARE. This is now against Facebook rules. Facebook now state that you can only get people to do something ON your page, i.e. comment on a post. You must also clearly state the rules, the terms and conditions, who is eligible and that the competition is in no way sponsored, endorsed or administered by, or associated with, Facebook. Another way to have great organic reach is to post content which is of interest to the people who like your page. If people like what you post, they will comment and share it. Higher post engagement means higher organic reach. It also matters what you post, whether it is a photo, a video, text or a link. Facebook don’t like you posting a photo and then putting a link in the text. It is much better to post the link direct in the text box. This way Facebook will automatically show the image on that page and the meta-description. You then have the option to upload a different photo and to edit the meta-description. Videos on Facebook get great organic reach. You can upload a video direct to your Facebook page. Remember that not everything you post will have great organic reach. Facebook have changed the rules and now most business pages average an organic reach of 10%. This means that if 1000 people LIKE your page, only around 100 will ever see your posts. Just because your competitors may have huge numbers of LIKES does not mean that people are actually seeing their posts. Having big numbers of Facebook Likes used to be what everyone aimed for. Now it’s more about post reach and engagement, quality over quantity.